Most of our clients find us either through our website or they’ve seen our products in a magazine or even on television. You probably already know that all our handcrafted, highly detailed windows and doors are custom made to order. So when you call our office and tell us you wish to add some Scottish Stained Glass to your home, you’ll be working with one of our talented designers to make sure you get the design, textures, colors and overall feel that you want. Let’s say you call us and tell us you wish to add some clear leaded glass to your sidelights and front door panel, and a colored stained glass piece to a transom window in your living room. 1. Speak to one of our designers on the phone, explaining what you want and the sizes of the windows. You will be able to get a general estimate as to the price at this time, as one main factor in the cost is the square footage. 4. You’ll look at many photos of different designs and styles, along with different textures, colors (if desired) and styles of beveled glass. If you have your own ideas, our designer will sketch them out. If you need some assistance making a decision, our designers are all highly experienced and have a great sense of which designs would complement your space. 5. Once you pick a style you like, our designer will draw it out on graph paper, showing you exactly how that particular design will fit in your window, and the exact cost of what you have chosen. Along with the square footage, the other main price consideration is the complexity of the pattern. In other words, the number of pieces in the pattern that need to be cut and soldered together. Interestingly, the color, texture or bevel effect in the glass does not impact the pricing at all. 6. If the cost is higher than your budget allows, the designer will work with you to adjust the design to make it more affordable. 7. Once that has been decided, we’ll ask for a 50% deposit, and you are done! Next, the materials are ordered, and the production process goes into motion. About a week to two weeks after your visit with our designer you will receive an email with a CAD drawing of your design, for your final approval. Then, in 4 – 6 weeks – voila — we’ll be calling you to arrange for the installation of your lovely new leaded glass artwork. As you can see, the process is easy and fun, and totally customized to your tastes, your style, and your budget. 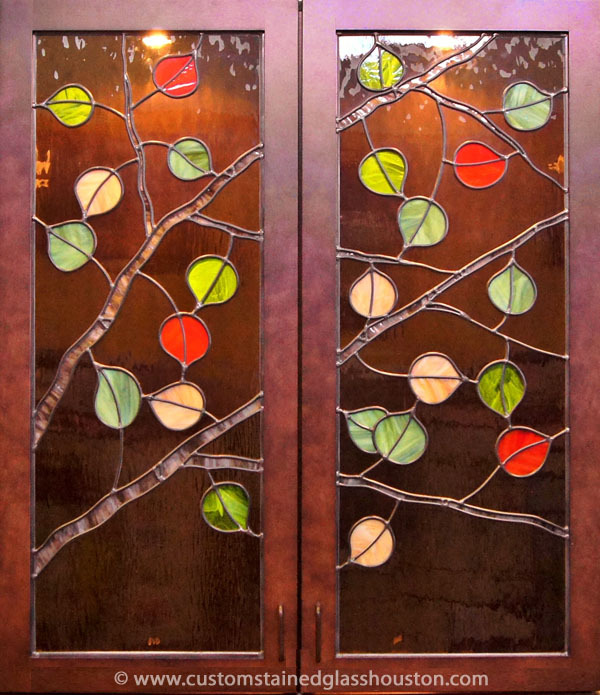 Give us a call today to start the design process for some beautiful stained glass in your home or office!